Here is my newest set of watercolor brushes built around Corel Painter 12’s Real Watercolors. I really like these variants, but like all watercolor brushes they can be slow. I would recommend putting them in their own library. If you do not know how to do that, look through my pages for one about making brush libraries and installing brushes. There are a number of very wet runny brushes. These are really cool if you make a paper that directs their flow. These brushes will only work for Painter 12. It is not possible to make them backward compatible to earlier versions of Corel Painter, since the real watercolor codes are only in Corel Painter 12. OK, that’s it. Download the brushes and have fun. With Painter 12.1 we can load a library including the brushes or a Category that can be installed in the Library of our choice. And many thanks for the brushes you have provided! Your watercolours are beautiful! As an illustrator I´have been looking for some nice water colour brushes Mostly for backgrounds, very hard to find in Painter. Have to say your bleeding brushes works very well! Thanks again for your time and your funny videos! Thanks for stopping by and leaving a comment. I appreciate it more than you know. I enjoy making brushes and it is so rewarding when someone with your talent likes the variants. Today after downloading new updates from Microsoft Wind. 7 My Wacom Intouos-4 Was no longer working! This has taken me hours to find out why. I had to reinstall computer (to an earlier date) get it to work again. Still don’t know what happened. I know this is not your table, but as a Wacom user you might have some idea..? 1. In the start menu, I enter services in search. 3. In the services window under services (local) I find tabletserviceswacom and double click it. Restart the computer and that seems to help. I cannot say for sure that this actually helps. I am not a techie. 😉 Your best source would be to check with wacom support. There is a new driver for the Intuos 4. I announced it on the blog, but then found out the European region had not updated the driver yet. I just checked and the driver number on Wacom Europe is the same number that is on the Americas…6.17-3. So, if you haven’t updated your driver that may help. It drives me nuts when things don’t work right! I downloaded the new driver 6.17-3 RC ( released on 09/06/2011 for Europe),and it seems to work! Just don’t know if I want to download any updates for Windows for a while.. This also drives me nuts and takes to much valuable time! I’m very new to painter (at least using it). 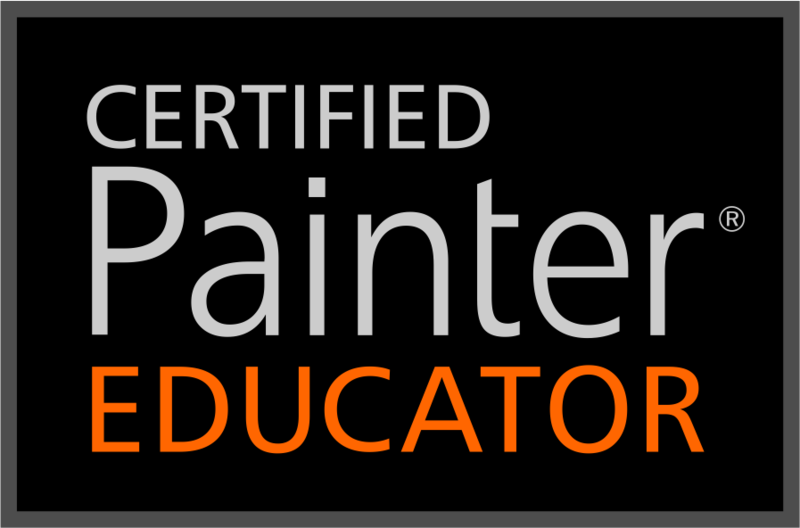 I’ve signed up for the Introduction to Painter 12 Part I class on digitalartacademy.com. I figure before I develop bad habits I’ll start at the beginning. I’ll do your brush class after I get the basics out of the way, however… I’ve been trying out the brushes in the Cool Spring download. I have trouble remembering what each looks like so I took some time and produced a bunch of sample sheets with each brush identified. I like the texture 4 but would like it to not sling the paint so far afield. What parameter affects the spread of the “droplets” for lack of a better word. I’ve found it good for a background I’m doing that will have a darker oval area in the middle and lighten up to the edges. I like the randomness but wish it would stay closer to where I paint. First let’s talk about installing the brushes in the user area. That is the best place to install custom brushes and libraries, however, there is a pesky bug that is causing the problem you encountered. You need to install in the applications area instead. Look at my other pages and you will find one about libraries and installing brushes. It will tell you how to work in the applications area, but you sound like you know your stuff and probably do not need direction. Now, about those names for brushes. In your class, you will find out that you can rename the brushes, which I think is cool. That way, you can change the names to what works best for you. If Elaina doesn’t cover it in Part 1, ask her about it and she will explain it. To tame that texture 4 brush, go to Window > Brush Control Panel > Jitter. In the jitter panel lower the amount. I have it set to 4, which is give me all you got. You may want to try 2 or less. After you have it set the way you like it, go to Brushes > Save Variant and save the variant with a name that will remind you it is your variation on Texture 4.
with your video lessons.I am still a beginner,working now with Corel Painter 12. I am studying on your cardinal-bird picture,by following your explanation on the video. “Runny nest RCW-2”,for starting to clone.The brushes that I miss are: from Fill 2-capt to Wet into Wet 5.That makes about 15 more brushes. Your English is very good. I wish I knew your native language and could reply using it. I looked at Google Translate and Dutch is there, but not Belgium Dutch. I wasn’t sure if Dutch would work for you. Your question is a good one. When I was doing the demonstration of the Cardinal, I was using Cool Spring in their raw form. I had not completed making the set. When I completed the set, I used different names for the variants. The 15 variants you are missing are actually in Cool Spring or in Drips and Runs. Unfortunately, I do not remember what I named each variant. I do know that Wet into Wet 5 is in Drips and Runs and it is called Runny Paper 03. I think Fill 2-capt is also in Drips and Runs. I believe it is Runny Fill 03, but I am pretty sure I changed it some from original Fill 2-capt. Runny nest RCW-2 looks similar to Drips and Runs Drippy 01. You are not the first person who has asked this question. Next time, I will not demonstrate with a set until it is finished, or at least write down what the new names are. Thank you so much for visiting the blog. I hope you come back often. Please feel free to ask any questions you may have. Hello, I downloaded your Cool Spring brushes to follow the tutorial about watercolor clone, but I can’t load them in Painter XI. I’ve got an error xml message. Cool Spring brushes are using a new feature that is in Painter 12. It isn’t backward compatible to Painter 11. I would take Cool Spring out of Painter 12; it will always cause an error message. If you decide to upgrade to Painter 12, then you can use them. Thank you so much for visiting my blog. I wish I had better news for you. Thanks for dropping by and making a comment. I hope Tim will have a class using the brushes soon. That will be terrific. I am very new to Corel Painter. Today I was trying to download you Brush “Cool Spring” . I fallowed all steps from your tutorial about “Brush Libraries and Brush Installation”, however it is not working!! I checked the files inside the “cool Spring” folder, I can not see any BRUSH CATHEGORY FOLDERS inside it, also I can not find any file which called” skipBlenderlong.xml , Can you please advise me how can I download the “Cool Spring” brush library, which can work in Corel Painter 12? I hadn’t approved this message because we started talking through email. But, it is that this is a different Ana. So, Ana, if I haven’t answered your questions, please let me know. I hope I have…if not, I am very late answering. Question, is there vidio tutorials youve done on some of your water color paintings I find in the gallery especially “By the Lake2” would love to see how you did it and what you used thanks again Skip your amazing. i just Watch the landscape painting whit you and karen. i downloaded the brushes from this site, but half off all the brushes you use in the vidio, is not included in the download is the the plan?. btw im a big fan off you. So sorry for the delay in answering. If I understand which video you are watching, the brushes I used are in the sets for download, but when I released the sets, I changed the names. I know; big mistake, right? If you can provide me with the link to the video that you watched, I’ll see if I can give you more information. That IS good news. I’m glad the brushes are working for you. Thank you so much for posting the link. Your work is outstanding; I enjoyed looking at your gallery very much. It is so exciting when I can see art work that used a brush or two of mine. I hope others take a look. Thanks again. I appreciate your comment more than you know. It means a lot you like my work, thank you for taking the time to take a look 🙂 I’m finding my feet at the moment with this software but I’m addicted to digital art now and really enjoying it. I will use many of your brushes in the future i’m sure and i’ll credit you where I can for being an amazing help in getting the results I wan from painter. Thank you so much again for sharing your wonderful brushes, bravo sir! Sorry for the delay in my reply; I got sidetracked. I looked at all of your work and think it is wonderful stuff. It is OK to share links; I think others would enjoy seeing your work. You are just amazing, a real motivation for students like me. Expecting more tutorials also from your side. Thank you Deepak! More tutorials are coming. I am working on something concerning patterns, but I have a bit more to learn before I post. Thanks for stopping by and leaving a nice comment. It looks great and just the thing I need – thanks for sharing your knowledge and brushes. So I downloaded this set of brushes here, but can’t seem to find all the brushes you use in the video. “Very Wet 6A” as an example. Can you point me in the right direction? Thanks for the help and all your tutorials. I’m so sorry for the late reply…had computer problems, but am back up and running now. When I did that video, some of the brushes were new and were later added to a brush set. I’m unsure now which brush is Very Wet 6A. But you should be able to use Cool Spring Category brushes to create the painting that I did. Play with all the very wet brushes and see what you get. If I remember correctly, all I did with very wet 6A was to increase the opacity. Use Very Wet 6. You can find the Cool Spring brushes at the top of the blog…look for Cool Spring download. Hope this helps. If you still need the Very Wet 6A, I’ll try to find it and post if for you. Yes, the Cool Spring and other brushes created with Painter 12 are compatible with Painter X3. Painter brushes are forward compatible, but not backward. In other words, brushes created in Painter IX, X, 11, and 12 would work in Painter X3, but brushes created in Painter X3 would not be compatible with Painter IX, X, 11 and 12. Is this also true (brushes being forward compatible) with Painter 2016? I’ve been downloading your brush libraries with much excitement, but it just occurred to me that they might not work with Painter 2016, or worse, cause problems….? I hope they do b/c I’m really looking forward to using them. Thanks! Yes, variants are forward compatible, but not backward. You should not have any trouble installing or using any of the libraries available on my site. Thank you Skip, and thank you so much for generously offering your brushes to the general public. Your brushes are absolutely wonderful and I look forward to using them. I’m sorry, but I never made that brush available and I have changed it so many times that it is no longer the same brush. I’m not even sure if I could recreate it now. Thank you for your sharing, I really appreciate this..
Wow! Great brushes–thank you so much, you generous soul! You are most welcomed. Enjoy!! I have downloaded your CoolSpring brushes and I am really really thankfull for this awesome stuff! and asking myself if you have “renamed” the brushes. Is that possible? For example, I can not find the brush “wet into wet – 3 pkup”. I am so sorry for the late reply. Yes, I probably did change some of the names of the variants. But, I still see wet into wet 3 pkup in my version of Cool Springs. Did you download the category from my blog? I’m not sure why you do not have it.